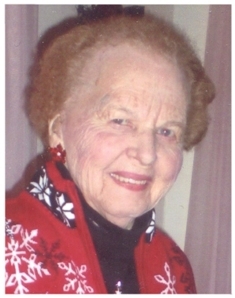 Bernice T. Schoen, nee Eide, passed away Friday August 8, 2014 in her Foster Street home in Port Washington,WI at the age of 96, where she had lived for 61 years. 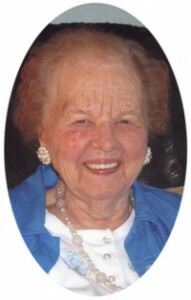 It was in this home where she joyfully welcomed her children, grandchildren and great-grandchildren and their families. She was born May 31, 1918 in Jackson County, Town of Curran, north of Hixton, Wisconsin; the daughter of Sever and Lilly Olstad Eide. After graduation from Hixton High School, Bernice attended Wisconsin Business University in LaCrosse for two years. She was employed at several government agencies, including Forest Products Laboratory in Madison. On June 29, 1946, she married Everett G. Schoen of the Town of Union, WI in Hixton, WI and moved to Port Washington. The couple raised three children – Shirley (Phillip) Groothousen, Sandra (Dale) Landgren and Dean (Patricia) Schoen. Everett died on May 13, 1989 from heart disease and cancer. Eight grandchildren and thirteen great-grandchildren were added to the family, many of which visited her weekly throughout her entire life. Bernice continued working during her married life and was employed for 36 years at Modern Equipment Company in Port Washington. She spent several of those years as secretary to the president of the company. She retired in 1983. After her retirement, Bernice cared for her husband and family. Her children, grandchildren and great-grandchildren brought her abundant happiness and she loved having her home filled with family. Her sharp mind, quick wit and her hospitality made her a blessing to be around. Family gatherings Sunday after church, with everyone together, were “the biggest joy in her life”. Bernice was also an active participant in the community, always helping with elections. She was active with her church, participating in Bible study, Alter Guild and clerking duties. In addition to her husband and parents, she is preceded in death by her three sisters and two brothers. She is further survived by her sister Doris Holder of Black River Falls, nieces, nephews, other relatives and friends. Funeral services will be held at 11 AM Tuesday, August 12, 2014 at St. John Lutheran Church, 217 W. Freeman Drive, Port Washington. Pastor John Klieve will preside. Interment will take place in Union Cemetery in Port Washington. Visitation will take place 4-6 PM Monday, August 11 at the Poole Funeral Home, 203 N Wisconsin Street, Port Washington and 10-11 AM Tuesday AT CHURCH prior to the service. Memorials to the church are appreciated. I am very sorry to hear about your mother passing. Your family is in our prayers. Oh my grandma. I will miss you so much – your smile, your humor, your coke on ice, your delicious chocolate bars, your letters, your house, your strength, your wisdom, the calm to brought to my life….I will miss everything about you. I was so blessed to spend those 3 days with you. I’m trying not to “waste any tears” but I think it’s a battle I’m going to lose. Love you always lady – see you on the other side.